US, 1944, 107 minutes, Black and white. Mickey Rooney, Lewis Stone, Fay Holden, Cecilia Parker, Sara Haden, Ann Rutherford, Bonita Granville, Jean Porter, Herbert Marshall, the Wilde twins. 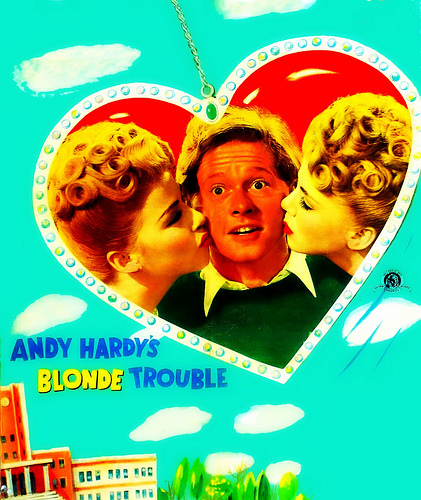 Andy Hardy's Blonde Trouble is one of the last of the series coming from the mid-'40s. It makes an immediate transition from the previous film where Andy was about to go to college. Here he met Susan Peters in the train, discovering that the college was to be co-educational. This film takes up the same sequence but Bonita Granville appears as the heroine. She was to appear in some of the subsequent films. The film shows Andy Hardy getting some independence from his family and the experience of going to college. He experiences Dean Standish on the train with Cathy and falls foul of him, only to discover that he is the dean. He continues in his early weeks at college, to encounter the dean and fall foul of him. Herbert Marshall's presence as the dean gives some acting strength and quality to the film. There is also some trouble with a set of twins who appear on the train. One is flirtatious with him, the other not. There is great confusion in his handling of girls as perceived by Cathy and by Dean Standish. There is also a question of the twins needing money to stay together and Andrew giving it them after they spin him yarns about freshmen with money. We see Andy charming, flirting, angry. We see his parents and their concern and Judge Hardy coming to the college to resolve the problems - and for the audience to discover that he had asked the dean to keep an eye on Andy. There is some psychological background identical twins and interpretation of their bonds - and the need for them to be separated. This is resolved quite nicely and the twins are able to move out of Andy's life. Bonita Granville is nice as the attractive heroine. There is a sub-plot about Judge Hardy's illness and the using of a Chinese doctor - with some scenes where Mrs Hardy is taken aback. Interesting to note this sympathetic attitude towards racial questions in the U.S. during World War Two. As enjoyable as any other film of the series.